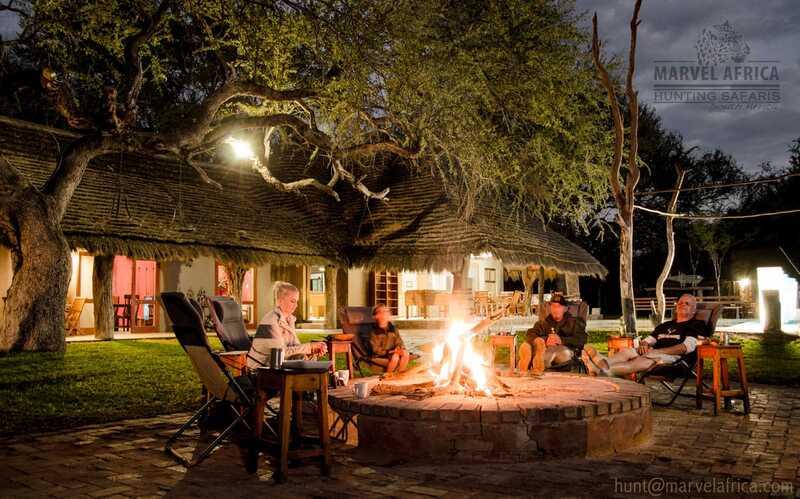 See what out happy customers has to say about their experience with Marvel Africa Hunting Safaris. [email protected] and become one of our satisfied clients and friends ! Would I go back? ABSOLUTLEY! Am I going back? ABSOLUTELY! As a member of the hunting community not only as a hunter but as a business owner directly servicing the industry I have the privilege of meeting a lot of people in the business and seeing it’s many layers. 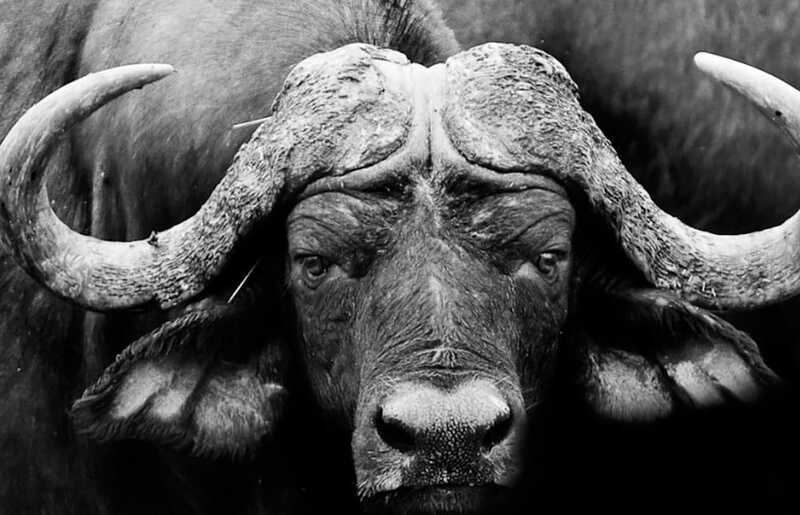 Like many going on Safari to South Africa for the first time I had a ton of questions and a lot of uncertainty about the process. I quickly realized I was in good hands by selecting Marcel and Salome de Villers of Marvel Africa Safaris as my outfitter for my first visit to the Dark Continent. Leading up my to departure I was in constant contact with Marcel on scheduling, transportation as well as to conveying my expectations of the hunt. Anytime I had a question Marcel was there with an answer which made me comfortable with the process. Being a bowhunter I had my own set of questions pertaining shot opportunities, distances as well as shot scenarios. Marcel was easily able to accommodate me as a bowhunter and paired me with a PH with extensive bowhunting experience which gave me to ability to focus completely on the hunt. Having a PH in the blind that understands what a bowhunter wants and the ability for us to “speak the same language” was a huge benefit and made sure we were on the same page leading up to the shot. While in the Bush the efforts of the Marcel and Salome left nothing to be desired. In addition, the work put in by the PH’s, trackers, skinners was top notch and gave me the opportunity to focus on what I was there to do……HUNT! There is so much that goes into handling a group on Safari; Marvel Africa made it look and feel easy which added in creating a positive hunting experience. If I had use one word to describe Marvel Africa it would be professional, professional from top to bottom. Would I go back? ABSOLUTLEY! Am I going back? ABSOLUTELY! Should you choose Marvel Africa for your Safari? ABSOLUTELY! When I first learned that I was going to South Africa thanks to the generosity of a drawing sponsored by Marvel Africa Safaris and the de Villiers family, I really didn’t know what to expect. In fairness to anyone reading this, Africa was not even on my proverbial “radar” prior to that date but after spending a week with Marcel, Salome and MJ…I simply cannot wait until I am able to go back! It’s an intimidating process (especially if you have never hunted in another Country before, like me), but Marcel was with me every step of the way. He contacted me immediately and provided me with the necessary forms to make transportation of my firearms seamless. 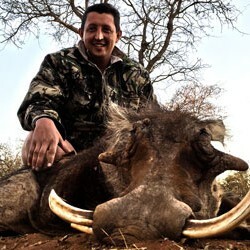 I began to research other outfitters to compare services and the one thing that stood out about Marvel Africa was its transparency and the fact that many of the other outfitters seemed to have complaints about “hidden charges” and “bait and switch” techniques. I can attest that Marvel Africa did not engage in any of these unprofessional tactics. Every aspect of the experience exceeded my expectations. Every hunt presented new challenges and Marvel is more than willing to tailor the experience to the physical capabilities of each hunter. Some days were spent riding the various properties searching for game or on foot tracking various species, but I was never asked to do anything my 50 year-old frame couldn’t handle. We enjoyed three meals each day prepared by a chef and his staff. We gathered every evening around the fire pit to enjoy some adult beverages, some laughs and some tall tales from the events of the day. This sense of “family” is not something that should be taken lightly…and it’s what made the entire experience completely unforgettable. I believe in “fair chase” hunting, and Marvel provided exactly that. I read so many nightmares about some outfitters that ostensibly provide their clients with nothing more than “shooting fish in a barrel.” That’s not me, and that’s definitely not Marvel. When an animal was harvested, the onsite processing facility ensured that nothing was wasted and that any trophy was tailored to my specifications. The professional tracker (Alfred) who was with me every step of the way made certain that any “less than perfect” shots did not end with the loss of the animal, and my cameraman (Zolo) captured each memory for me to enjoy for many years to come. In sum, Marvel Africa Safaris provided me with the experience of a lifetime. The camaraderie, the professionalism, the attention to detail and the transparency throughout allow me to recommend Marvel, without reservation. The hardest part about this trip was saying “goodbye” to Marcel, Salome and MJ (and the rest of the wonderful people who made the experience so phenomenal). Though tears were shed when I left…I have found solace in the fact that I know I will return and look forward to making that happen soon. I would welcome the opportunity to speak with anyone considering a trip to South Africa through Marvel Africa Safaris. May all of your hunts be successful and safe and may God Bless you all. "An absolute adventure" from start to finish. 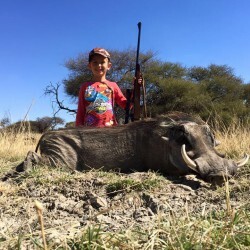 I booked the trip with Marvel Africa Safaris in hopes that it would be the hunting adventure I had always dreamed about as a young boy. Well it was everything I had hoped for and more. Marcel and his staff worked very hard to turn my expectations into realities. The accommodations were first class and the meals were second to none. He has a very dedicated staff. There was no difficulty in locating any of the species of animals that I had planned on hunting, and there were quite a few opportunities that arose where I could harvest animals that were not on my hit list, and I did harvest them . I felt confident that all my hides and horns would be handled and prepared properly for shipping, and they did arrive in great shape into the states. My local taxidermist commented on the excellent condition of the hides. I do highly recommend Marvel Africa Safaris if you are looking for an African adventure that you will cherish for a lifetime. Do expect to harvest more animals than you originally planned on hunting. It was better to ask my wife for forgiveness than for permission. "I made friends that I’ll have for the rest of my life"
I had wanted to hunt Africa for years. I never thought I’d see the day when I was low crawling through 600 yards of waist deep prairie grass stalking a trophy eland. I was actually thinking, ‘where will he go on my wall?’. The landscape is incredible and its unexplainable how many different species of animals we saw. Including a female rhino with her baby, a leopard and several herds of giraffe. Marvel was the first outfitter to explain the whole process to me and how they would walk me through every single process from getting the guns into the country to shipping the mounts back to Texas. When I got there, there were no questions left to be answered. I knew as much as the Outfitter knew. That’s how well I was informed by the time we arrived. When we got there, it was so much more than I had expected. The lodging was as fine as any you’d see at an upscale hunting ranch anywhere on this planet and the food was equally as amazing. Heck, they even had pizza. Everything was perfect; PHs, Trackers, food, lodging, the staff at the lodge and of course, Marcel and Salome. I made friends that I’ll have for the rest of my life. In fact, I still communicate with them almost daily. Thanks again for a “once in a lifetime experience”. Looking forward to the next time! I wanted write you and thank you again for the fabulous time you and your staff provided to my son Chris and I during the hunt and the help in getting the trophies back to the US ahead of schedule. The kudu looks great on the wall! I must admit, since this was my first trip to South Africa I was apprehensive regarding the process of making the arrangements but the detailed instructions and communications you provided made the whole process seamless. I also appreciate your staff meeting us at the airport and escorting us to the lodge to make sure we arrived without any issues. All of the hunts were fantastic and the professional hunters and trackers did a great job of finding the game, answering any questions, and selecting which animal I was to take. That of course left it up to me to make a good shot. 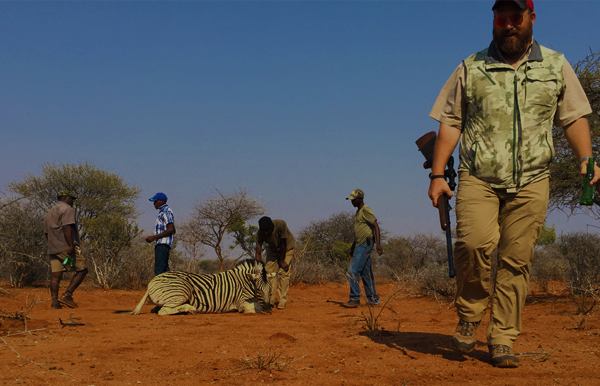 I was also impressed by their focus on our safety during the hunt and their patience in dealing with me since this was my first African hunting experience. The hunting was great but I also enjoyed the fellowship we shared as we sat around the campfire after the delicious dinners comparing stories and getting to know one another as individuals. Chris and I both agree that the whole experience was great value for what it cost and we are trying to make a second trip happen. Not sure when that will be but we will let you know when we get some dates. Take care and thanks again for a “once in a lifetime experience”. Looking forward to the next time!